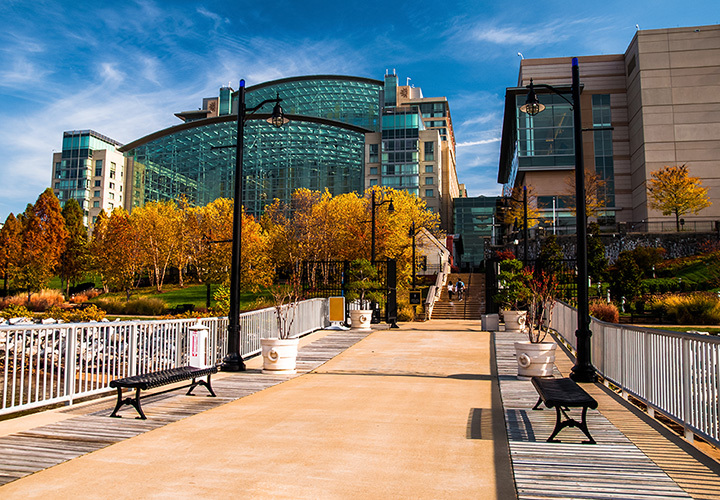 Maryland has a diverse range of attractions to draw guests to this beautiful state, but planning where to stay is an entirely different experience. Looking to make your stay memorable by staying overnight in a cabin? Or maybe in a house boat? A lighthouse? We’ve got all that and more in Maryland. Here are the 15 most unique hotels in the state. This is your destination for rustic family fun and here you can find cabins, gorgeous lake views, fireplaces, a pool and more. What makes this spot perfect for families is that there is hiking and lakefront activities to keep everyone busy. Staying at this innis a unique experience because instead of it being one large hotel building, you are staying in a series of connected row homes in downtown Baltimore. The rooms are gorgeous, antiques are everywhere, breakfast is truly delightful, and you can walk to everywhere you want to go in the city. No list of unique places to stay in Maryland would be complete without including the hobbit house. Yes, in Maryland, you can live like a hobbit. Found at the 20-acre campground, these houses are comfortable and nicely equipped but as rustic as one might imagine a hobbit lives. This is a spectacular experience because you can rent out the Lighthouse Keeper's Quarters at The Cove Point Lighthouse in Calvert County. This 1925 historic building is rustically beautiful with a huge white porch and Adirondack chairs, the most stunning of views, and access to the site’s private four-acre beach. Visitors are few and far between so you will have the run of the grounds to yourself most of the time. You have access to the entire house, making this is a location perfect for larger family gatherings. If you have ever seen “The Wedding Crashers,” then you are familiar with the Inn at Perry Cabin. This is a stunning Victorian manor house that is on the water in St. Michaels and the site of their family home in the movie. You can take your boat and dock at the hotel, stay in luxury, enjoy the spa, dine at the pub, and feel like you have been transported directly into the movie. This is secluded romance at its best. This is by far the best hotel to stay in during the holidays because of their famous ICE! event and display. The resort turns into a winter wonderland like no other and it’s spectacular. With its location next to D.C. it is also an excellent summer destination where you will find outdoor movies, concerts and events on a near daily basis. Book a houseboat that sleeps two to six, located on the Baltimore waterfront. These houses are surprisingly spacious inside and the accommodations are incredibly comfortable. Plus, you get the unique benefit of staying aboard a houseboat with all the gorgeous and stunning views that the Baltimore Harbor provides. This is a unique experience that few people will ever have, so if you're heading to Baltimore consider staying on the water instead of near it. Experience what it must have been like to stay in a hotel in a small charming Maryland town in the 1800s. You can do so by staying at the Atlantic and enjoying the Victorian guestrooms. The town is still equally charming and you will find small cafes and locally-owned shops within walking distance. Your kids can party like a pirate on their poolside pirate ship with slides, swim for hours, have fun in the splash area and then spend time and indoors at the arcade or 1950s dinner. This of course is when they aren't at hanging out at the Ocean City Beach. This one is a ton of fun. Hotel RL is a hotel design for millennials, free-thinkers, and anyone that is tired of the status quo. Here, you will not find hotel employees dressed in polyester uniforms. Instead, they will be walking around in jeans like hipsters ready to greet you with their tablets to check you in or take food and drink orders. In the lobby, they have a coffee bar serving free cappuccinos for guests and they will drive you around the city and their 1971 Volkswagen minibus. The hotel is designed with millennials and tech-savvy guests in mind to the point that you can even open your door using a smartphone app.